Knowing the intricacies of milk production and dairy management is all in a day’s work for Brownes Dairy IT manager, Brad Flintoff, who spearheaded a complete IT system overhaul of the dairy over the past few years. “Leaning the whole milk cycle, for example, how the milk you get throughout the year is very dependant on the weather. We get a lot of milk in spring. We get very little milk in winter, which is due to farming and the way the grass grows. "As well, the fat or cream content of milk changes rapidly throughout the year -- so that really affects our planning in terms of what products we make and when,” he said, explaining the dairy has contracts with 60 farmers and takes about 140 million litres of milk a year. Flintoff said he quickly learned the art and nuances of the dairy industry, while also blending his IT knowledge to help the company undergo a complete system overhaul - a process that was started a few years ago and is now seeing the benefits. He told CIO Australia the company needed to migrate quickly from existing IT infrastructure to achieve agility and scalability - a move precipitated by the acquisition of Brownes by private equity firm, Sydney-based Archer Capital, back from New Zealand dairy powerhouse, Fonterra. 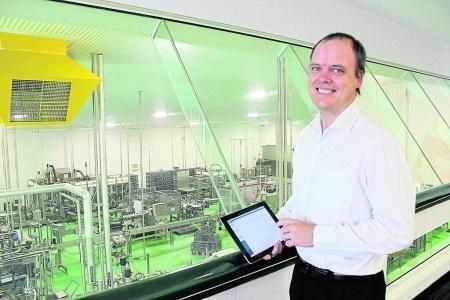 Brownes Dairy, considered Western Australia’s oldest and largest dairy (operating since 1886), has enjoyed increased efficiency and seamlessly acquired new businesses since deploying a fully virtualised IT infrastructure supported by VCE’s converged infrastructure, the first of its kind in Western Australia, according to Flintoff. Up until the acquisition, Flintoff said the IT systems of the dairy was all run out of New Zealand. As part of the technology transformation, the dairy chose a fully virtualised IT infrastructure, supported by VCE converged infrastructure. Since deploying Vblock, Flintoff said the dairy hasn’t had a single outage; there's been a reduction in IT operating costs; increased efficiency and reduced IT headcount. Additionally, he said the new IT environment has allowed remote access and improved flexibility and productivity. The elimination of hardware outages has been a big benefit of the system overhaul, he said. “If there is ever an outage, the business stops completely. We can’t receive orders, we can’t make product, we can’t get milk out of trucks, we can’t procure orders,” he said. He said the project was a massive task, culminating in decision-making across many layers of technology. “Our requirements at the time were predominantly around scalability, reliability and flexibility. At the time of implementing the infrastructure to run the business on, we didn’t actually know what applications we were going to be using, so it was defined in parallel with this project. "There was ERP, warehousing and all of the different applications that we needed to run the business on were being decided on, as well as all of the business processes being fleshed out while we were putting the hardware and infrastructure together,” he said. Flintoff, who was head hunted for the role at Brownes and formerly worked for global brands and amassed a range of global expertise, said his move to the dairy was an interesting change. “I came from a much larger company, working across all of Southeast Asia for Campbell Soups and Arnotts Biscuits, and so coming to a single site little dairy I guess wasn’t that daunting. It was more the timeframe and the speed that needed to be done. It was a contractual legal obligation to be off the Fonterra system within 24 months,” he said. It was an exciting opportunity that he said doesn’t come along very often. “I wasn’t too daunted by it all. It was an exciting time and very rarely to you actually get the opportunity to do what is a greenfield install, where you can design everything from scratch and do it properly without having to worry about legacy systems,” he said. He said there were no major pain points during the system overhaul process. “There were a lot of late nights and a lot of hard work, but it was all very rewarding. It has been an interesting journey in terms of understanding business processes and how IT can provide information more quickly and enable decisions to be more informed in real-time." With the IT overhaul firmly in place, and a fully virtualised environment (giving the dairy flexibility and adaptability), Flintoff said the next step is to start looking at more digitisation in the manufacturing process in the next 12 to 18 months. A big focus for Flintoff at the moment is on the business processes and on export. The company is also investigating whether to move into a shared cloud environment or whether to maintain its own private cloud. “We are tossing up those sorts of scenarios at the moment on the infrastructure side. On the business side, it is more around getting more real-time data from the actual factory line itself: getting sensors in the factory to start gathering information and then bring in analytics to provide the real-time information to make things more efficient and cheaper to produce, which is the end game."